This entry was posted on November 29, 2016, in Book Post, Slide Show. Bookmark the permalink. A Day at a Time is an entertaining collection of stories, observations and anecdotes to be treasured and enjoyed. A thoughtful, poignant, funny and inspirational collection that will never fail to uplift, amuse and enlighten. 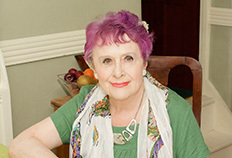 Spanning self-help, humour, biography, history and a little bit of spirituality, here is a wonderful example of Mary Kenny’s signature wit, talent and charm. « What Do People Pray For?